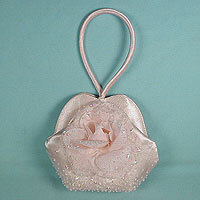 Small satin purse with knotted clasp and flower and leaf beading on front. 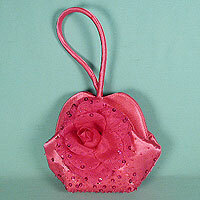 This lovely little purse has is embellished with bugle beads in a beaded flower and leaf design on one corner. It has a unique closure with a cord overlapping another cord with a know which keeps it in place like a button. It includes a matching shoulder strap with a 22 inch drop, is lined and has an inside pocket. Color: hot pink. Hue: bright pink. color code: #FF6582. 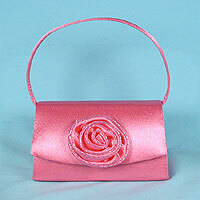 Measurements: width 6½", height 5-1/4", depth 2"
Small satin clutch evening bag with rose trim. This evening purse is darling. It comes in satin with a matching flower decoration. The flap has two scallops and covers a little over half the front. It has a snap closure and is fully lined. It can be worn as an clutch or over the shoulder with the enclosed matching strap. Perfect as a prom bag, it also works well evenings out. 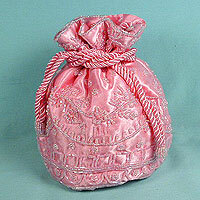 Measurements: width 6", height 4", depth 1-3/4"
Compact satin purse with handle and beaded large rose trim. 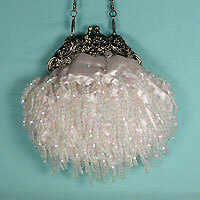 Measurements: width 6", height 3-1/4", depth 2½"
Elegant art deco vintage look beaded and sequined oval evening bag. 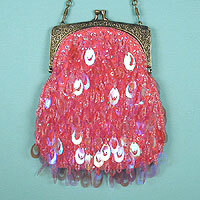 Both the front and back of the evening bag are satin and decorated in loops of seed beads with loop sequins attached. This beautiful bag has a scrolled brass tone frame with a kissing ball lock and includes a brass tone detachable 13-inch handle. It could be used as a clutch bag with the chain removed. The interior is lined in satin and has a pocket on the side. 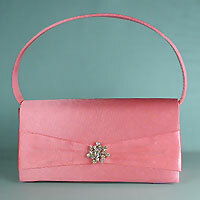 This is the perfect purse to wear with a long gown or evening dress. 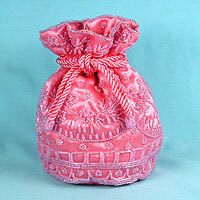 It is large enough for a cell phone as well as many other purse accessories. 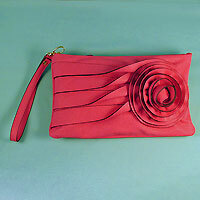 Measurements: width 6½", height 7", depth 1½"
Faux leather envelope purse with large flower, pleats and wrist band. 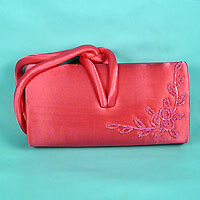 Measurements: width 11", height 6½", depth 1"
Lovely satin clutch purse with beaded flap. 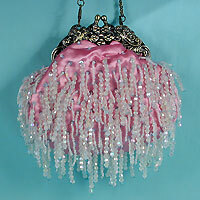 This beautiful evening bag comes in a wide variety of colors. It has a snap closure, is fully lined with a side pocket and has a matching shoulder cord with a twenty-two inch drop. 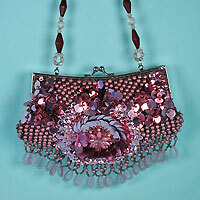 If you need a purse with a little glitz that does not compete with your dress, this may be just right for your.